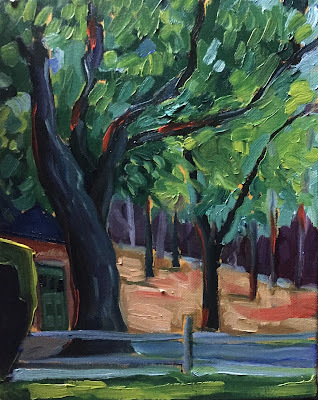 Today is a work day- luckily I had 30 minutes before I started work to get this one in- and also it is very fortunate that the Art Complex has so many beautiful trees to paint! Still a limited palette but I added ultramarine blue and cad red medium to the mix. We got a lot of rain and thunder right after I pulled the easel inside! Yikes!